One way to understand the people and a place is through the food. By exploring the local flavors, one appreciates the destination at a deeper level. Cambodian cuisine surprised us on our quest for the authentic foods in Cambodia. 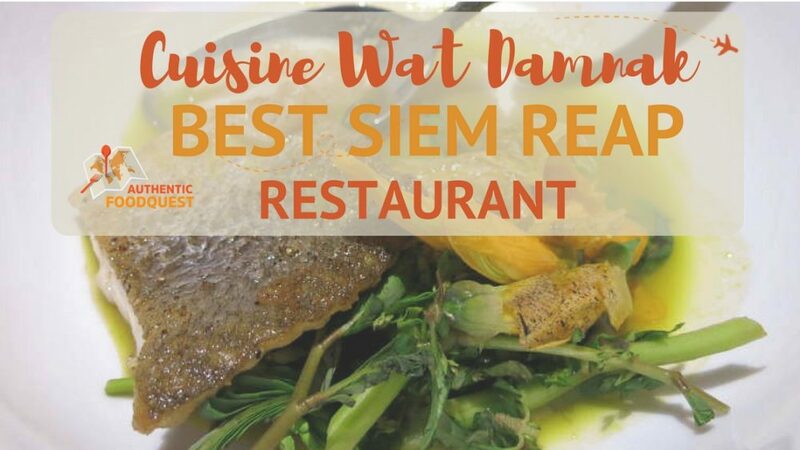 In Siem Reap, we were immediately intrigued when we heard about chef Joannès Rivière, of Cuisine Wat Damnak. Using fresh ingredients sourced from all over Siem Reap, he blends authentic Cambodian flavors with creative French culinary techniques. Our Airbnb host, Dalia, an expat in Siem Reap raved about the restaurant and convinced us to dine there. The issue was that we hadn’t made reservations in advance and it was during the busy Christmas and New Year period. Fortunately, Dalia was able to creatively get us a reservation. 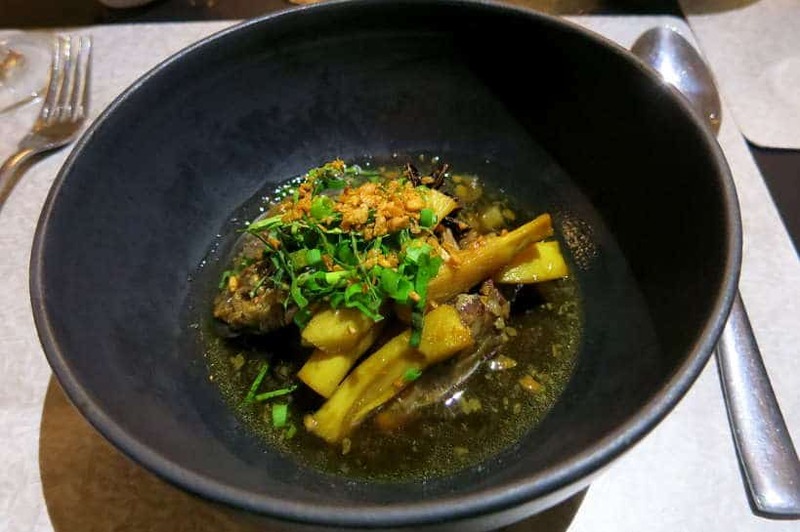 We could not miss the opportunity to experience creative Cambodian cuisine, recently named The Best Restaurant in Cambodia in Asia’s 50 Best Restaurants. 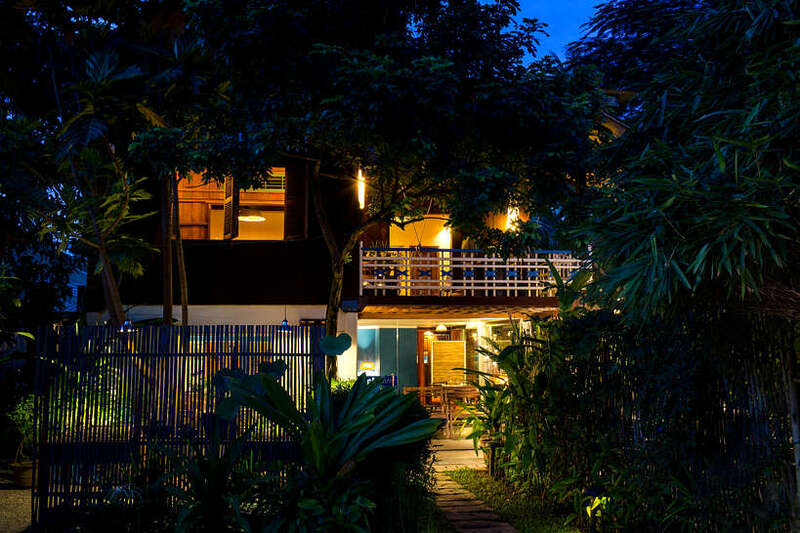 Siem Reap is the destination of choice for many visitors to Cambodia. Indeed, Siem Reap is the city next to Angkor Wat, a UNESCO World Heritage site and the largest religious monument in the world. 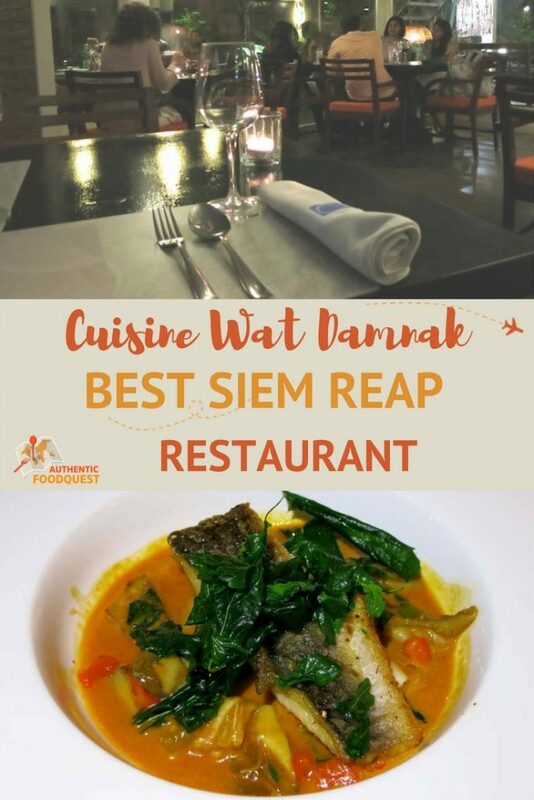 In the food scene, Cuisine Wat Damnak is the first Cambodian restaurant to land on Asia’s 50 Best Restaurant. It is run by executive chef Joannès Rivière and his wife Carole Salmon since April 2011. The restaurant is housed in a traditional Cambodian wooden house in the Southeast part of town, near Wat Damnak. In Siem Reap, neighborhoods are named after a Wat or temple. So, the restaurant, Cuisine Wat Damnak is named after the temple in the neighborhood where it is located. Angkor Wat is a Buddhist temple which is worth a detour. 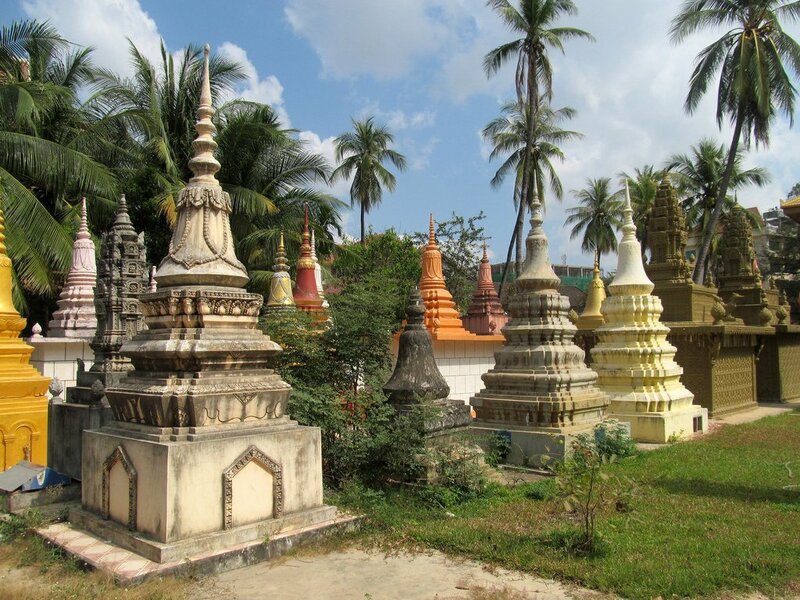 Feel free to visit the quiet pagoda and check out the Center of Khmer studies before your dinner. Now, let’s explore the local flavors at Cuisine Wat Damnak. The restaurant offers two tasting menus which change every two weeks. Chef Joannès uses locally sourced produce and unique ingredients. He aims to showcase Cambodian products cooked in a creative way. 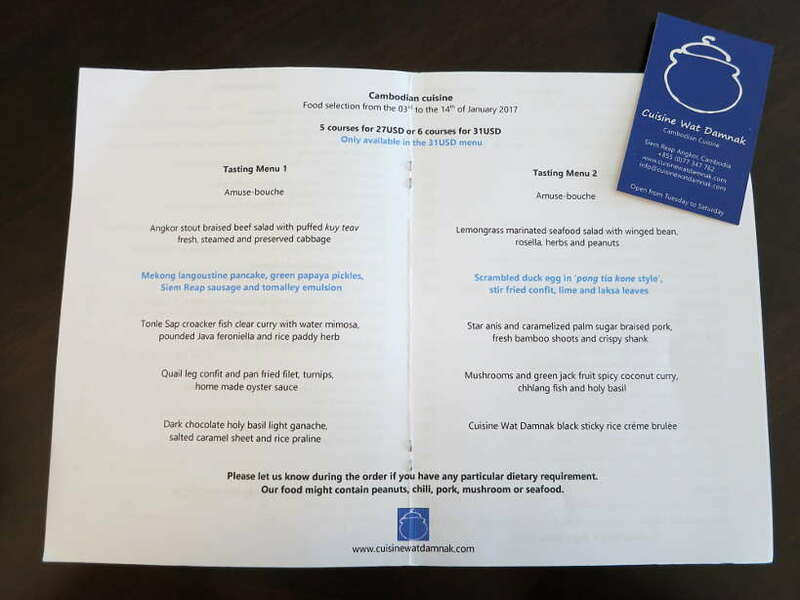 Once seated in the cosy restaurant, you be given the menu for the week, which is a two page booklet. There are only two options. One five-course menu for $27 USD and one 6-course menu for $31 USD. While the 5-course menu offers plenty, we couldn’t resist getting the full 6 course-menu at one of the best Asian Restaurants in the world. How often do you have the chance to taste locally sourced “Mekong langoustine” or “duck egg in pong tia kone style”? The beverage menu at Cuisine Wat Damnak is full of surprises. You will find cocktails made with local spices and ingredients. Sample drinks with unique ingredients like kaffir lime, pomelo and ginger infused brandy, Tamarind infused vodka and more. 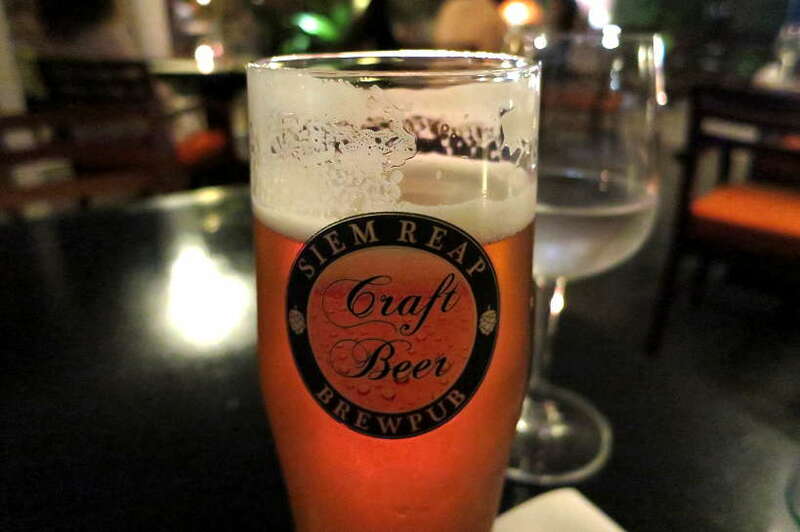 If you are a beer love, you will enjoy the refreshing and smooth draft beers by Siem Reap Brewpub. The wine list has a nice international selection from France, Italy, Australia, South Africa and more. 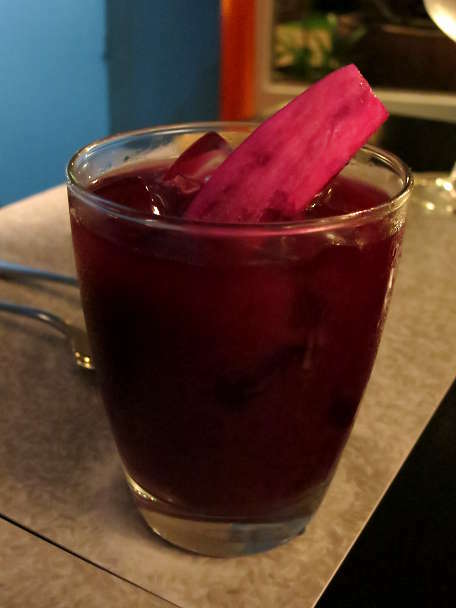 I typically prefer wine with dinner, but was tempted by the “Purple dragon fruit sangria”. Made with purple dragon fruit, passion fruit and Phnom Kulen Vanilla, this was a delicious “bloody” refreshment. Claire settled on local craft beer from Siem Reap Brewpub. It was her chance to try a local beer beyond the regional Southeast Asian beers. Her verdict? “A refreshing and tasty beer. A nice change from some of the regional bland beers”. 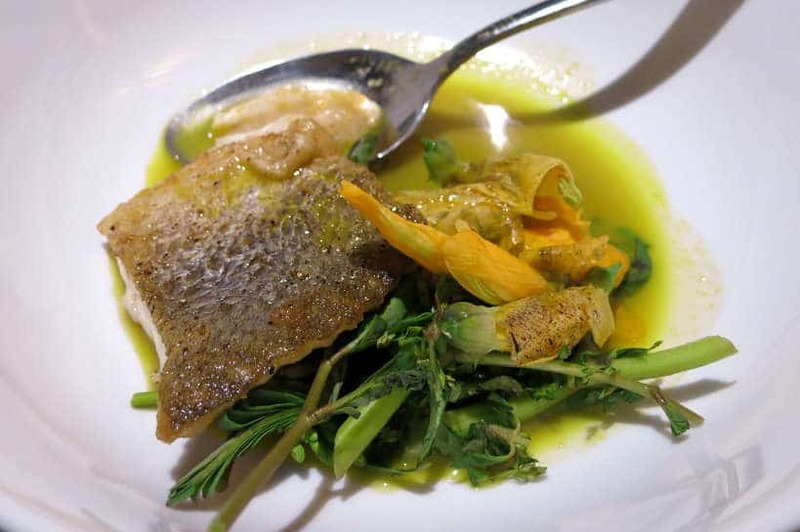 Chef Rivière personally selects the freshest local and seasonal ingredients for his kitchen. The flavors are authentic including the unique bitter and sour tastes we wrote about in our recent article Cambodian cuisine:12 unique dishes to feast on. On the menu that evening were locally sourced meat and seafood dishes. 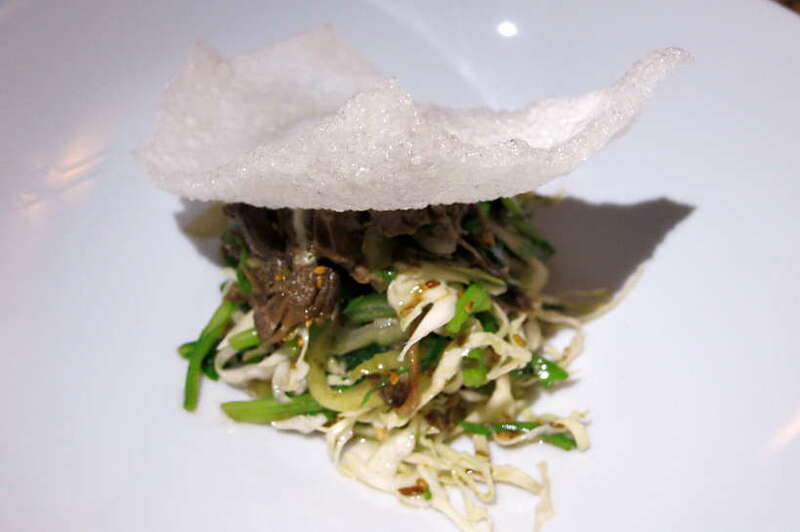 Following are highlights on what you can expect at Cuisine Wat Damnak. In Cambodia, fish and seafood are the most popular source of protein. Not surprisingly, seafood and fish dishes are found throughout the menu. 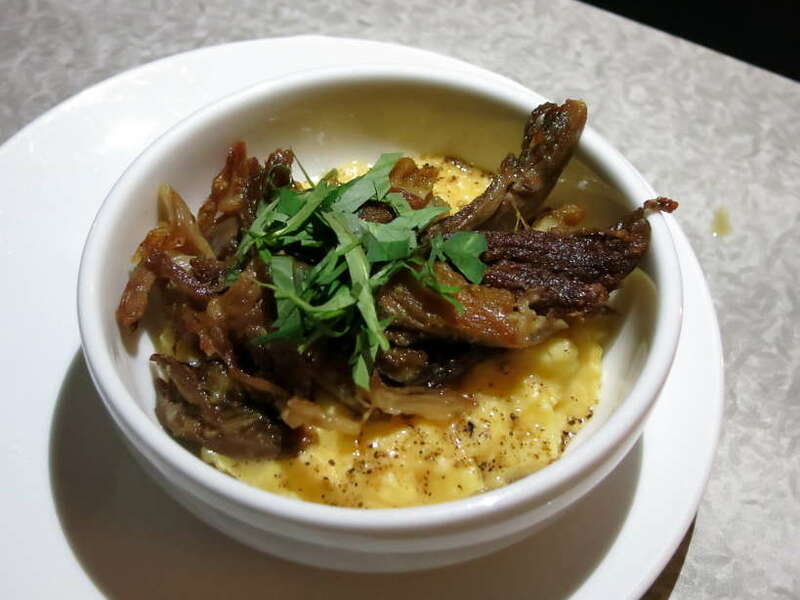 From the amuse-bouche (small complimentary appetizer) to the appetizer and main meals. The ingredients like Mekong langoustine, Tonlé Sap fish and Chhlang fish all come from nearby freshwater lakes and rivers. 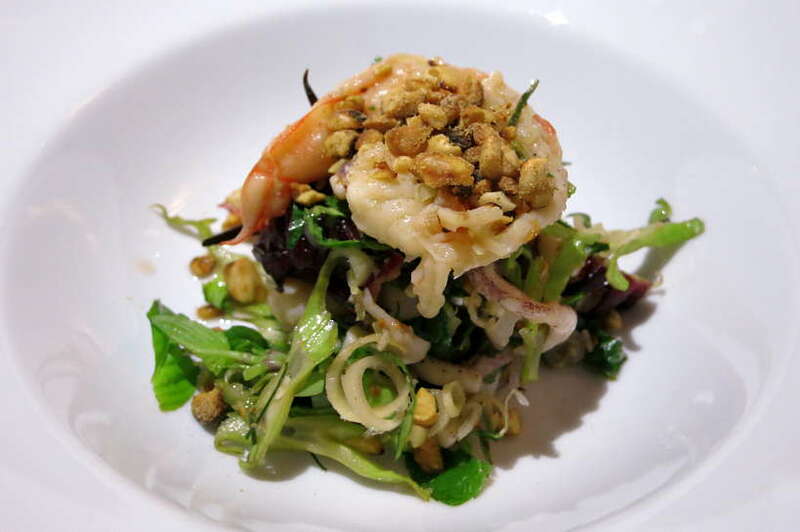 Appetizer: Lemongrass marinated seafood salad with winged beans, rosella, herbs and peanuts. On the whole, all the fish and seafood dishes were quite tasty. The combinations unusual, and the flavors quite distinctive. Without any reservation, the Mekong langoustine was our favorite. The fresh seafood, sweet Siem Reap sausages and crispy green papaya pickles was a phenomenal explosion of flavors. Cooked to perfection, this masterpiece was divine. 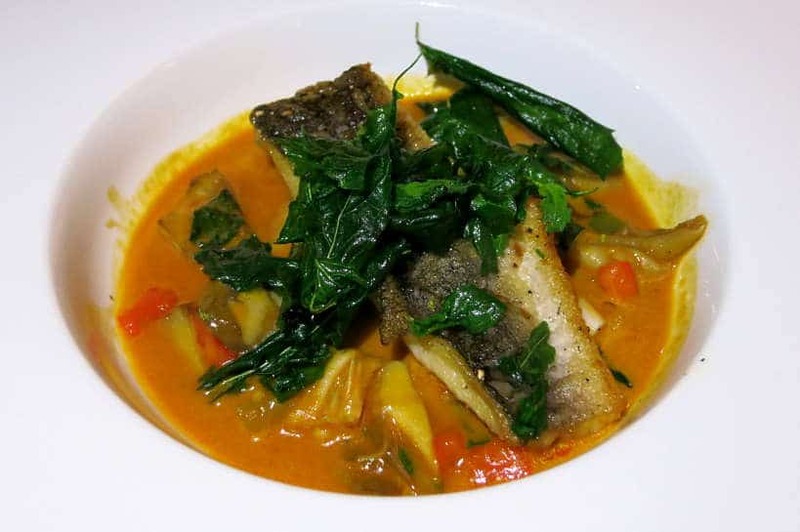 The rice paddy herbs in the Tonle Sap fish curry gives off lemon and citrusy flavors found in sour Khmer food. The flavors were interesting and the textures unusual. Delicious, yet subtle, this was an enjoyable sensorial experience. While fish is much more common than meat in Khmer cuisine, Cuisine Wat Damnak does include meat in both menus. The ingredients and dishes are traditional, and the cooking technique creative. 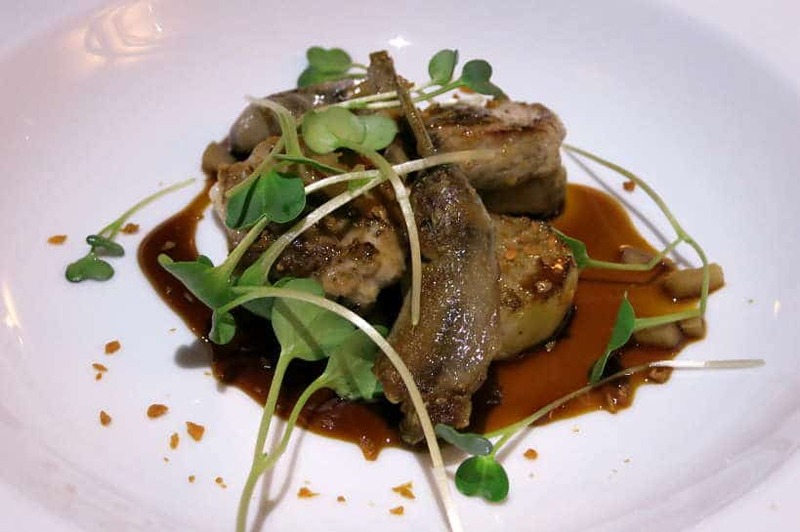 The blend of traditional and contemporary was clearly evident in all the meat based dishes. Our favorite appetizer put a creative twist on kuy teav, the most popular Cambodian breakfast dish. In addition, soaking the braised beef in Angkor stout beer, the most popular beer brand resulted in an amazing dish, tender and full of flavor. The most impressive meat dish was braised pork. One of things that made it so unique was the use of palm sugar, which is used in Cambodian cuisine. We discovered palm sugar while taking a cooking class at La Table Khmère in Phnom Penh. Rather than the sweet taste one would expect from sugar, palm sugar gives smokey flavors that enhance the dish. The bamboo shoots were quite tasty and they are commonly found in Khmer cuisine. They are high in protein and said to improve blood circulation. The scrambled duck egg in pong tia kone style is inspired by the embryo egg popular popular in Khmer food, which is a boiled egg containing a duck embryo. The version at Cuisine Wat Damnak, was more palatable. Overall, the meat based dishes were delicious and covered a range of flavor dimensions. In his culinary journey, chef Joannès worked as a pastry chef in the U.S.for two years. This training and background came through in the fabulous desserts. There were two dessert options on the menu and we tried them both. The French connection was the most prominent in these revisited French desserts. 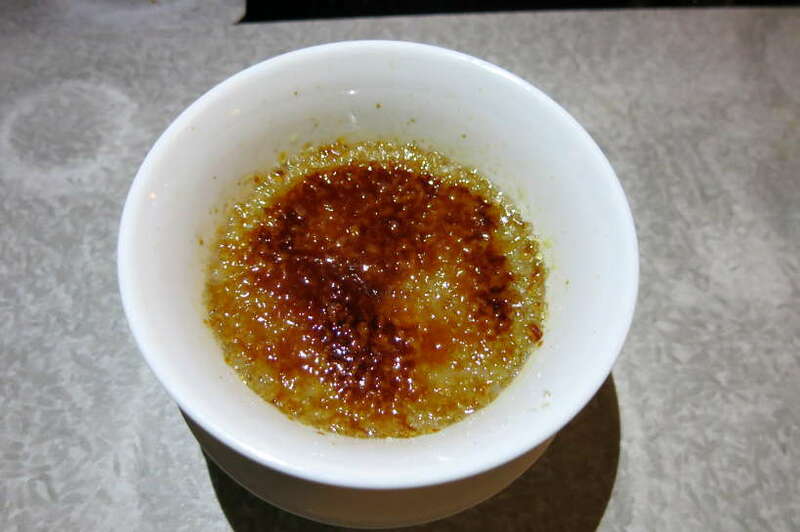 The traditional crème brulée is made with local sticky rice, a staple of Southeast Asian countries. The ganache was elegantly presented and resembled a snail. 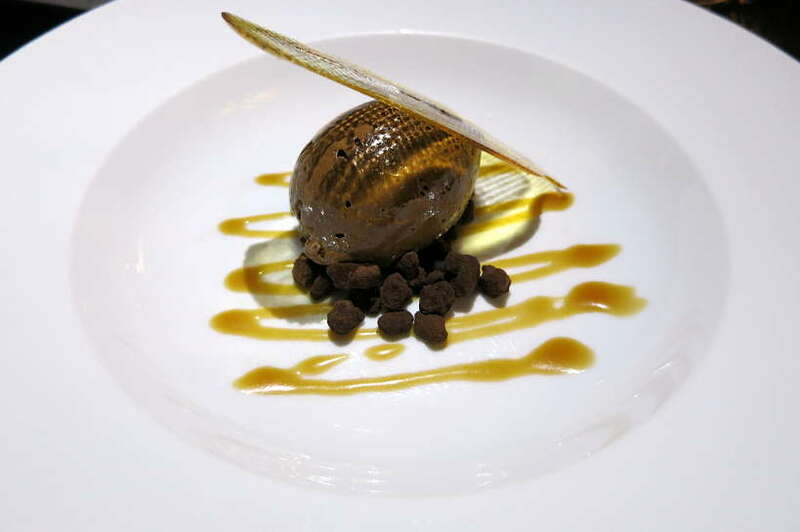 Maybe it was a “clin d’oeil” (a nod) to the popular freshwater snail snack sold in the street of Phnom Penh or the famous French chocolate “Escargot de Lanvin”. Cuisine Wat Damnak reserved a special surprise for the end of our copious meal. 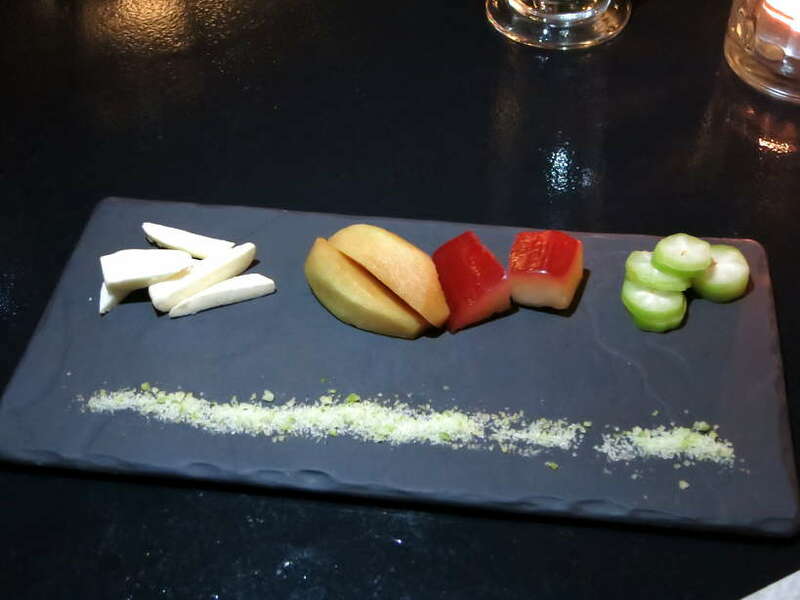 Chef Joannès served us a plate of fresh fruits cut into pieces with a line of chili and kaffir lime infused salt and sugar mix. We had the chance to taste zapote, rose apple and tree cucumber, all indigenous fruits of Southeast Asia. This was the perfect finish to a scrumptious meal. Eating the local cuisine and traditional dishes on your travels is a way to have a full appreciation of a destination. In Siem Reap, Cuisine Wat Damnak is an experience not to be missed. The opportunity to taste local ingredients and unusual produce sourced from the area will give you a fuller appreciation of Cambodian cuisine. If this article made you salivate and you want to make Cambodian cuisine at home, search no more! Chef Joannès Rivière is also the author of Cambodian Cooking, a book of authentic Cambodian recipes to prepare easily at home. 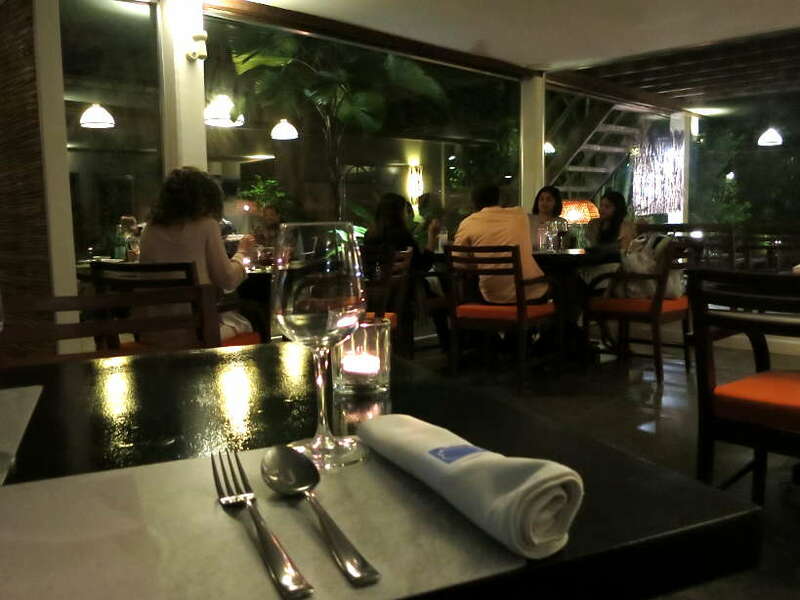 Have you had an amazing fine dining experience with local flavors on your travels? Please share with us where you had it! Book at least two weeks in advance or more depending on the season. Keep in mind that bookings open 90 days in advance. Pro Tip: If you are too late to book ahead, you may have a chance by walking in later at night (around 8pm-ish) during the weekdays. Getting There: The best way to get there is to take the local transportation, a tuk-tuk. 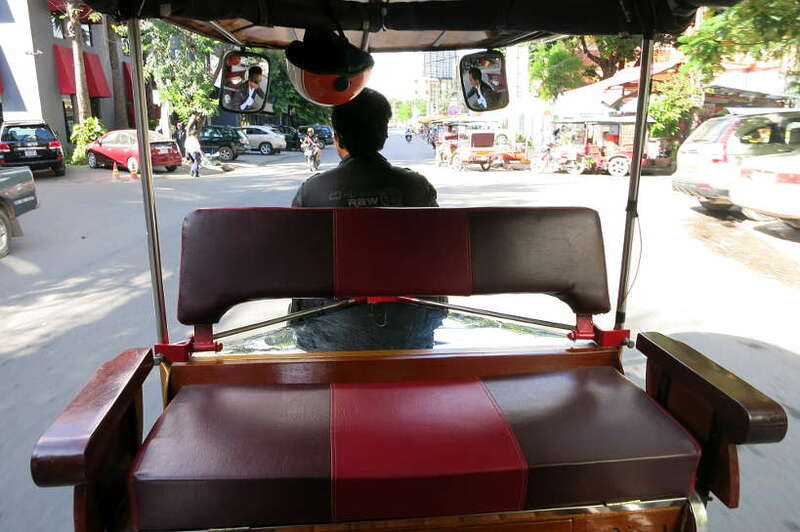 From downtown Siem Reap, the ride should cost no more than $2 to $3. Glad you found the article informative and inspiring enough to make you want to try Cambodian cuisine. 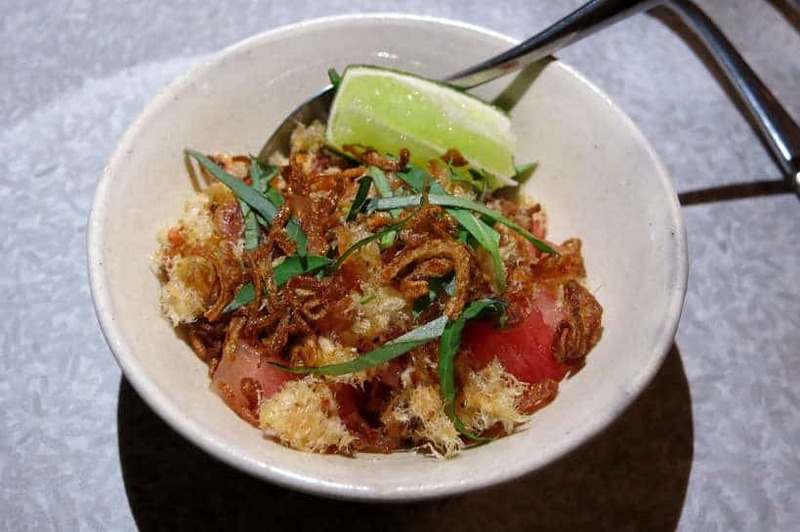 While it is not as popular as other Southeast Asian dishes, it does have it’s own unique and tasty flavors. A must!! Thanks so much for your feedback. So glad you enjoyed the article and the food. A truly exceptional experience. Omg this is amazing. Great food can be so difficult to find while traveling in a foreign language country. Thanks so much, I definitely following this website now. At authentic food quest, we aim to make it easier for travelers to find the local specialties on their travels. Feel free to reach out with any questions 🙂 Cheers. The purple dragon fruit sangria was quite unbelievable. The blend of flavors was so unique, which is typical in Cambodian cuisine. Hope you get a chance to visit the beautiful country soon. I didn’t hear about this place while we were there! Sticky rice creme brulee sounds ridiculously amazing. The restaurant is a hidden gem and well worth the experience. The food was exceptional and indeed the stick rice creme brulee was a personal favorite. Thanks for stopping by. Wow looks like you had an amazing meal! Good tip that reservations are required, I will for sure be checking it out when I make it to Cambodia! When are you going to Cambodia? Don’t forget to check out all the Cambodian food specialties we discovered on the website. For reservations, book as early in advance as you can. Best would be 90-days in advance!! Don’t hesitate to reach out with any questions. Wish I had this guide when I was in Cambodia — I was lost when it came to food! Ah bummer… to hear that Lucy. Navigating the food scene in Cambodia is not easy! If you plan on going back again, definitively take the guide or share with others who are going. Thanks for stopping by. There does seem to be some alignment. I sense a trip back to Cambodia for you 🙂 We also wrote about the street food dishes in Cambodia, but here we had to put a spotlight on this unique creative Cambodian cuisine. Thanks Becky and hope you make it back to Cambodia soon. 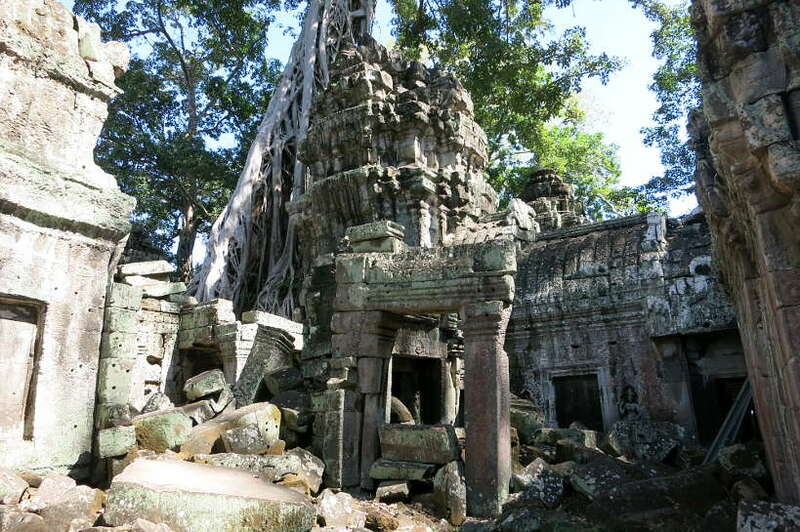 Cambodia is a beautiful country that is rich in history. If you’ve never been, it is worth including on your list of countries to visit. Indeed an experience at Cuisine Wat Damnak is a delicious way to round out that experience. Thanks for stopping by. That sounds like such an interesting experience? Does the chef have a vegetarian or non-shellfish option? Actually, the chef is very accommodating and can modify the menu based on dietary requirements. The only catch is that you have to book in advance and confirm any menu changes. The chef cooks with local and fresh ingredients so making your needs known in advance is really helpful. Glad you enjoyed the article. Cheers. You are so welcome. If you do make it to Cambodia, remember to book in advance to experience the creative flair to Cambodian cuisine. Thanks for stopping by. So glad that you enjoyed reading the article and the menu. It is quite an experience. Keep in mind that with the holiday season gets to be quite busy. Do book in advance. Recommended time is 90 days in advance 🙂 And yes, that sangria with dragonfruit was quite unusual and tasty 🙂 Thanks, Natasha. wow I’ve never had cambodian food before. Or actually I’ve never even seen cambodian food before. It definitely looks like a bit of a gourmet version of local cuisine. and $31 is not bad! well in us standards that’s not bad haha. Everything looks delicious Rosemary. Especially that desert. And hey; what a nice change up from the roasted tarantulas you see at the bus stop when arriving in Siem Reap 😉 Nice to know Cambodia offers fabulous fare. We loved some veggie haunts in the capital. Rosemary, you ladies have done it again. Making me drool and want to go to Cambodia just for the food! Sangria and tamarind vodka, heck yeah! The shrimp with the peanuts looks quite perfect, too. Thank you so much Melody for the compliments!! Truly appreciate it. The food in Cambodia is not as well known as compared to its neighbors and it needs to get the attention it deserves 🙂 The meals are exquisite and the setting delightful. Worth flying over for 🙂 Cheers! Cuisine Wat Damnak looks like a nice spot for a romantic dinner and $31 for that many courses is a steal! I still haven’t been to Siem Reap and I’m definitely visiting soon. One of those purple dragon fruit sangrias has my name on it! 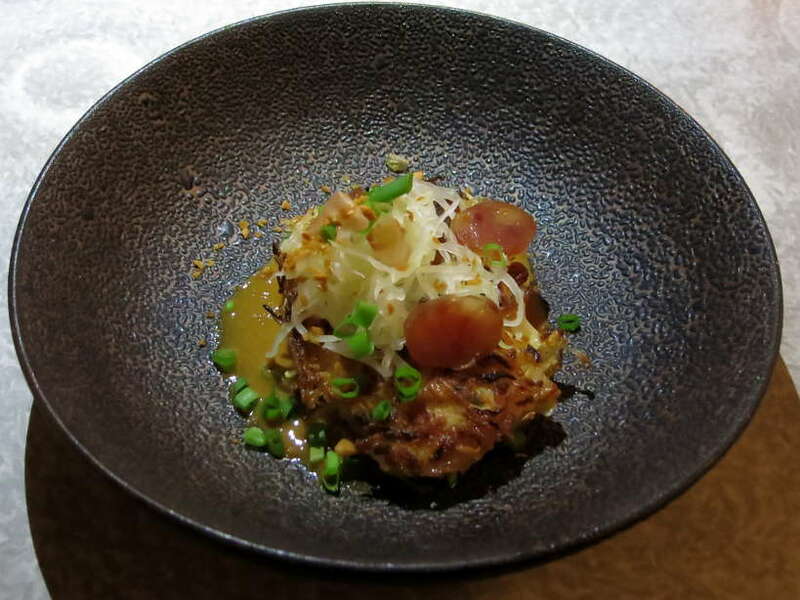 It’s not often you can eat at one of the top restaurants in Asia for $31. Quite a steal and an incredible experience. Do remember to book in advance and come back and let us know about your experience. Thanks, Christina. This restaurant sounds like a dream! The desserts are to die for. I feel like visiting Cambodia again just to try this place. Thanks so much Barb. Agree, Cuisine Wat Damnak is definitively worth traveling back to Cambodia for 🙂 Cheers. I am so glad to have discovered your blog the other day. You got me at “explore local flavors.” This post, like all the others, hurts. So many beautiful dishes and I have to wait until I go there to eat them! That’s wonderful to hear Peter. Glad to have you join us. Yes, exploring the local flavors does make a trip so much more meaningful. The food is worth a trip to Cambodia 🙂 Cheers. I wish I had known about this restaurant when I was in Siem Reap. I can’t believe you can get such an amazing 6-course meal for only $31 USD. It looks absolutely delicious. 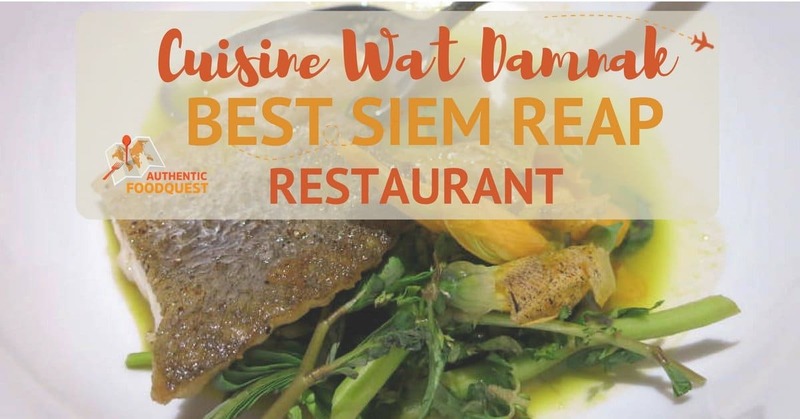 That’s a bummer that you missed Cuisine Wat Damnak on your travels to Siem Reap. Now, all the more reason to go back 🙂 Cheers. You are so right Carmen, local hosts are a wealth of information! Cuisine Wat Damnak is absolutely worth it, you’ll have a delectable time. Thanks for stopping by.